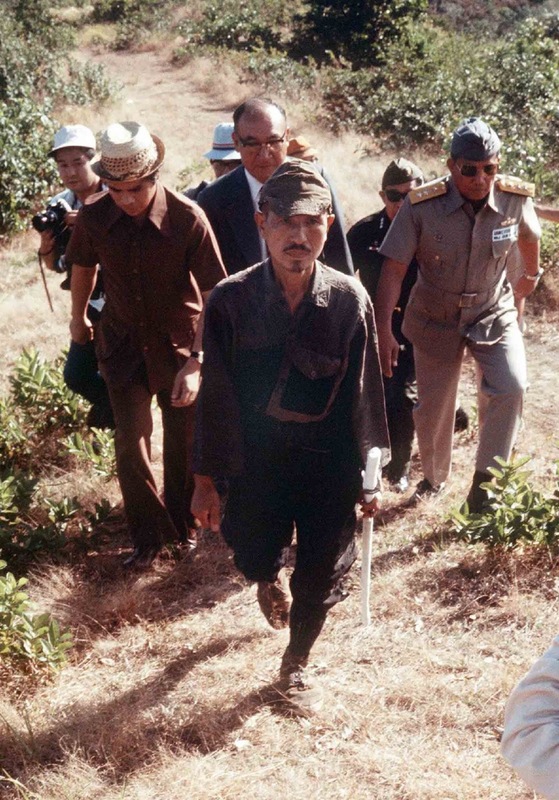 Lt. Hiroo Onoda, sword in hand, walks out of the jungle on Lubang Island after a nearly 29-year guerrilla campaign. March 11, 1974. 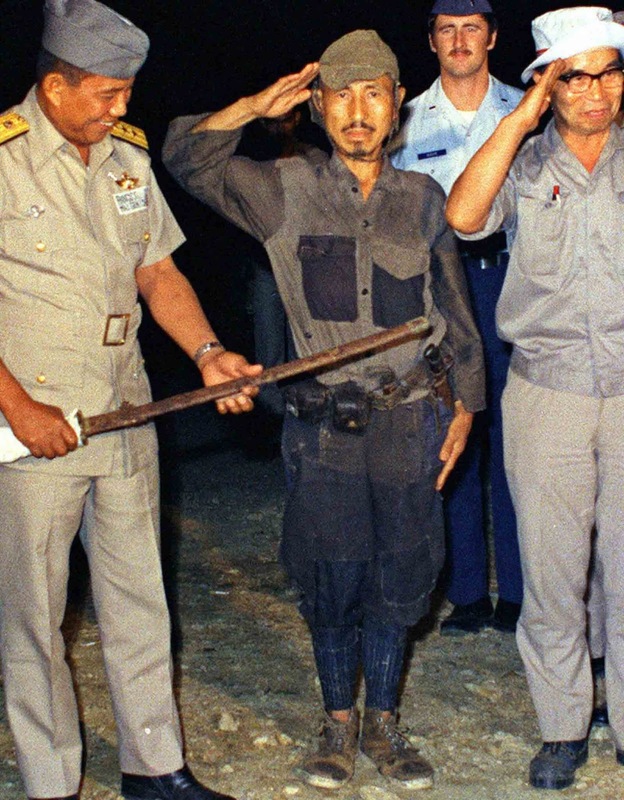 Lieutenant Hiroo Onoda is the most famous of the so-called Japanese holdouts, a collection of Imperial Army stragglers who continued to hide out in the South Pacific for several years after World War II had ended. An intelligence officer, Onoda had been on Lubang since 1944, a few months before the Americans invaded and retook the Philippines. The last instructions he had received from his immediate superior ordered him to retreat to the interior of the island – which was small and in truth of minimal importance – and harass the Allied occupying forces until the Imperial Japanese Army eventually returned. “You are absolutely forbidden to die by your own hand”, he was told. “It may take three years, it may take five, but whatever happens, we’ll come back for you. Until then, so long as you have one soldier, you are to continue to lead him”. Onoda continued his campaign as a Japanese holdout, initially living in the mountains with three fellow soldiers (Private Yūichi Akatsu, Corporal Shōichi Shimada and Private First Class Kinshichi Kozuka). 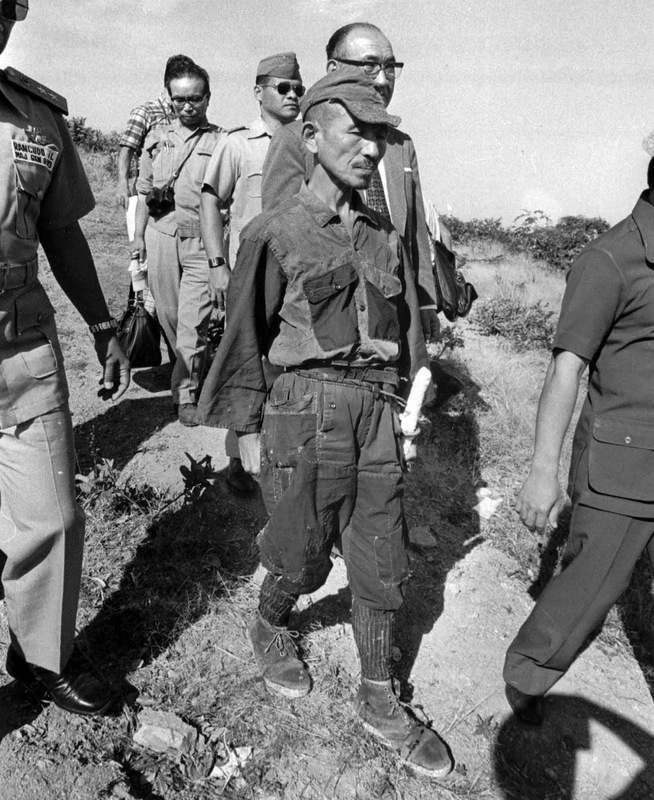 During his stay, Onoda and his companions carried out guerrilla activities and engaged in several shootouts with the police. 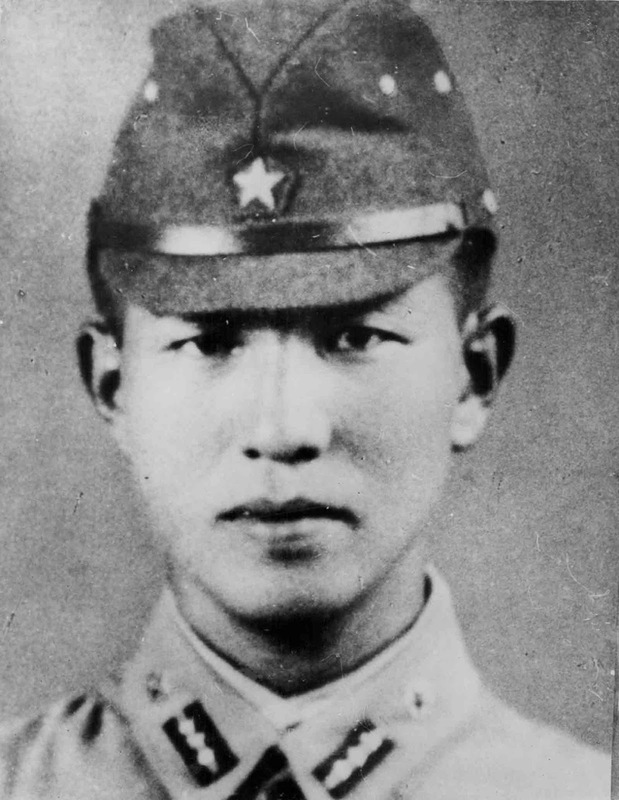 Lieutenant Hiroo Onoda was 22 years old when he was deployed to Lubang Island in the Philippines in December 1944. The first time they saw a leaflet announcing that Japan had surrendered was in October 1945; another cell had killed a cow and found a leaflet left behind by islanders which read: “The war ended on August 15. Come down from the mountain!”. However, they mistrusted the leaflet. They concluded that the leaflet was Allied propaganda, and also believed that they would not have been fired on if the war had indeed been over. 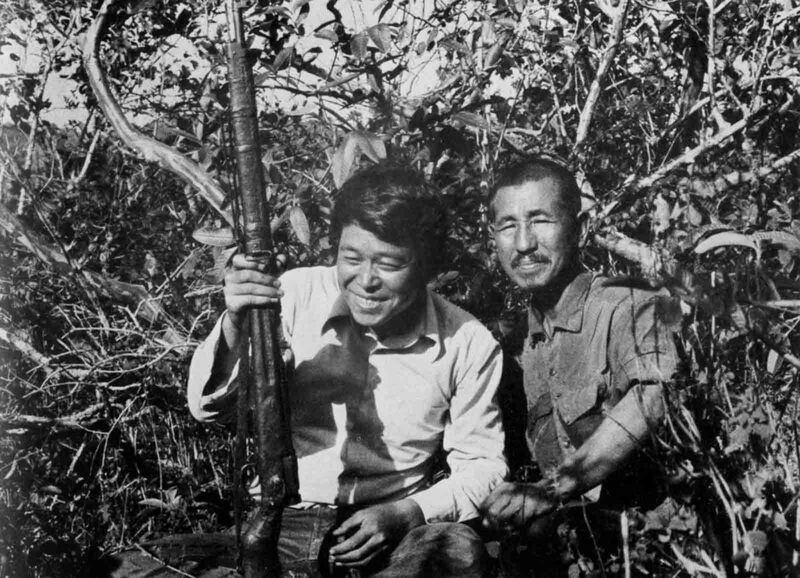 Norio Suzuki poses with Onoda and his rifle after finding him in the jungles of Lubang Island. February, 1974. One of the four, Yuichi Akatsu walked away from the others in September 1949 and surrendered to Filipino forces in 1950 after six months on his own. This seemed like a security problem to the others and they became even more careful. In 1952 letters and family pictures were dropped from aircraft urging them to surrender, but the three soldiers concluded that this was a trick. On February 20, 1974, Onoda met a Japanese man, Norio Suzuki, who was traveling around the world, looking for “Lieutenant Onoda, a panda, and the Abominable Snowman, in that order”. Suzuki found Onoda after four days of searching. Onoda described this moment in a 2010 interview: “This hippie boy Suzuki came to the island to listen to the feelings of a Japanese soldier. Suzuki asked me why I would not come out…”. Onoda and Suzuki became friends, but Onoda still refused to surrender, saying that he was waiting for orders from a superior officer. 1. In accordance with the Imperial command, the Fourteenth Area Army has ceased all combat activity. 2. In accordance with military Headquarters Command No. A-2003, the Special Squadron of Staff’s Headquarters is relieved of all military duties. 3. Units and individuals under the command of Special Squadron are to cease military activities and operations immediately and place themselves under the command of the nearest superior officer. When no officer can be found, they are to communicate with the American or Philippine forces and follow their directives. 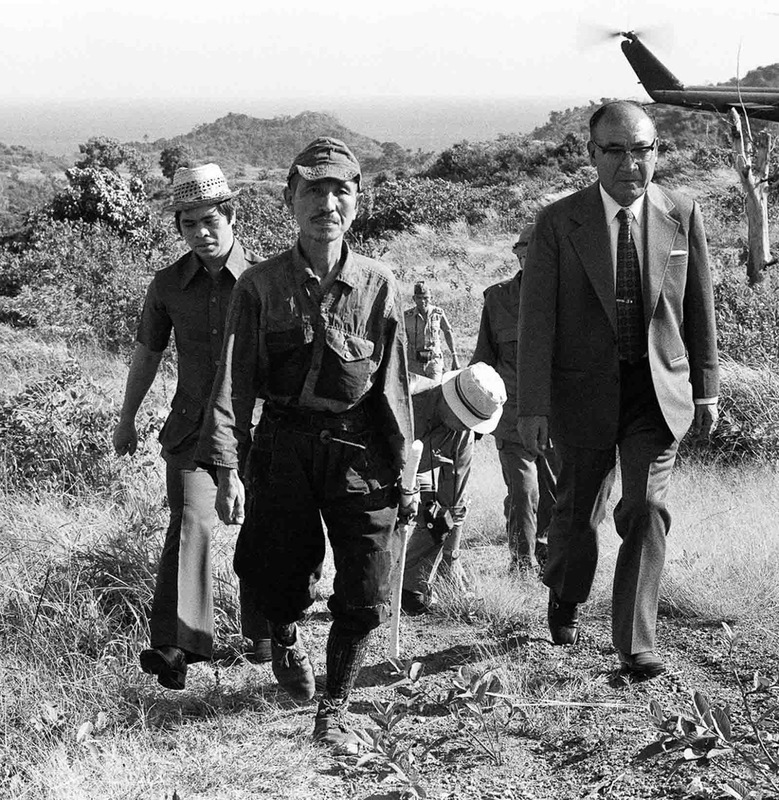 In this March, 1974 file photo, Hiroo Onoda, wearing his 30-year-old imperial army uniform, cap and sword, walks down a slope as he heads for a helicopter landing site on Lubang Island for a flight to Manila when he comes out of hiding in the jungle on the island, Philippines. Onoda was thus properly relieved of duty, and he surrendered. He turned over his sword, his functioning Arisaka Type 99 rifle, 500 rounds of ammunition and several hand grenades, as well as the dagger his mother had given him in 1944 to kill himself with if he was captured. Though he had killed people and engaged in shootouts with the police, the circumstances (namely, that he believed that the war was still ongoing) were taken into consideration, and Onoda received a pardon from President Ferdinand Marcos. He was reportedly unhappy being the subject of so much attention and troubled by what he saw as the withering of traditional Japanese values. 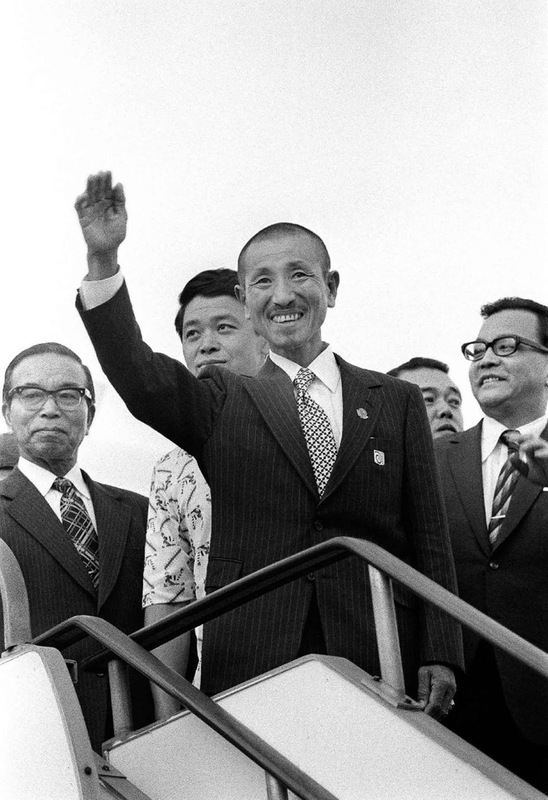 In April 1975, he followed the example of his elder brother Tadao and left Japan for Brazil, where he raised cattle. He married in 1976 and assumed a leading role in Colônia Jamic (Jamic Colony), the Japanese community in Terenos, Mato Grosso do Sul, Brazil. 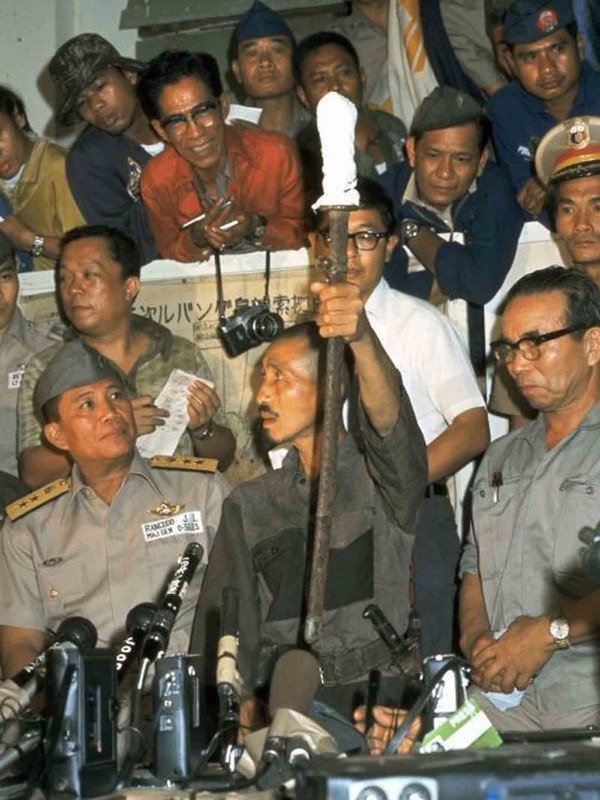 Hiroo Onoda shows his Japanese sword during a press conference on March 10, 1974 in Lubang, Philippines. 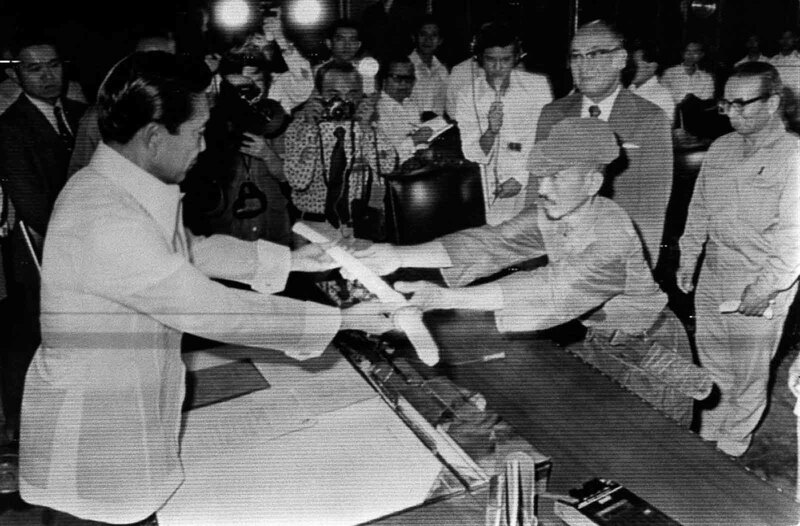 Onoda surrendering his sword to Philippine President Ferdinand Marcos, and received a pardon for his actions over the previous decades (he and his companions had killed some 30 people in their long war). Onoda waves upon arriving back in Tokyo. March 12, 1974. 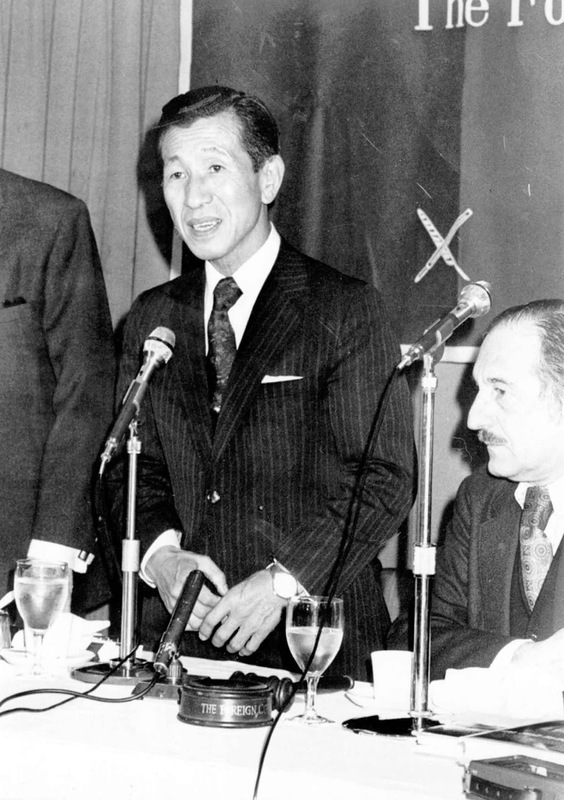 Onoda speaks at a Press Club luncheon in his honor. February 25, 1975. After reading about a Japanese teenager who had murdered his parents in 1980, Onoda returned to Japan in 1984 and established the Onoda Shizen Juku (“Onoda Nature School”) educational camp for young people, held at various locations in Japan. Onoda died of heart failure on 16 January 2014, at St. Luke’s International Hospital in Tokyo, due to complications from pneumonia. Japanese Chief Cabinet Secretary Yoshihide Suga commented on his death: “I vividly remember that I was reassured of the end of the war when Mr Onoda returned to Japan” and also praised his will to survive. I'd read a novel named 'AMOK' by George Fox that told of a Japanese soldier who lurked in the jungles long after the war had been over. How else do you define a die-hard fighter? This reminds me of a 1974 episode of The Six Million Dollar Man called The Last Kamikaze. It was all about an officer like Onoda. I saw that episode again a few years ago, after having read about Mr. Onoda. It was a good one. Hadn't known Mr. Onoda had finally left us; may he be resting peacefully and "havin' a smoke" with all the other WWII troops that have left us. Even though he was of the "enemy" forces way back then, you've gotta admire the man's loyalty and determination. That it took his old commander issuing the orders to cease operations to get him to stop shows how seriously Mr. Onoda took his duties. That's an old-school example of a he-man, there.